Friday's mild conditions changed over to a soggy mix of snow and rain overnight for some areas, bringing a wet start to the weekend. Northern New Jersey could see wet snow that could accumulate up to 1 to 3 inches. The advisory is in effect until 5 a.m.
A cold front is also bringing more clouds, snow showers and possibly rain overnight. Flurries may continue on and off throughout the day Saturday, but accumulations should be light. Another storm may develop offshore, but should stay far enough from the coast to keep snowfall east of the New York City. 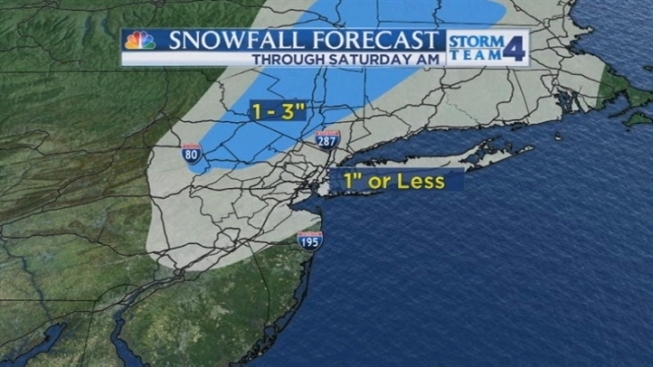 Long Island may see some light accumulations Saturday night. Expect increasingly strong and gusty winds on Sunday, along with a return to colder temperatures. Highs will likely not rise above freezing. Monday will also see temperatures in the 30s and rain is possible for Tuesday. Below are your forecasts through next week. TONIGHT: Cloudy, some light snow developing after midnight, may be mixed with rain at the start. SUNDAY: Partial sun, windy and very cold. WEDNESDAY: Morning clouds giving way to clearing, windy and chilly.